 An award-winning Wall Street Journal reporter chronicles the troubling world of organ transplantation. The human drama is center stage here, but McCartney does much more than tell the stories of patients getting new livers at Baylor University Medical Center in Texas. 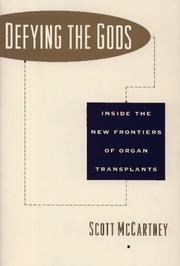 He traces the history of organ transplantation, with emphasis on Thomas Starzl, the dean of liver transplant surgeons and the man who handpicked Goran Klintmalm to head Baylor's transplant team; he reveals how the organ donor system works, or rather how it breaks down; and he raises public policy issues that any national health care system must address. How should recipients of new organs be selected? How should the too few organs available be allocated? How should the high-cost transplants be financed? McCartney explores transplantation as a lucrative business for hospitals, a rewarding and challenging profession for doctors, and a truly harrowing experience, both emotionally and physically, for patients. The dramatic stories of the four patients featured here--Randy Roady, Mel Berg, Arden Lynn, and Don Bryan--show that surgery is but a small part of the whole process. Getting accepted into the transplant program and then waiting for a liver are nerve-racking procedures, and recovery is never guaranteed and seldom smooth. McCartney is there at the doctors' elbows as they race to harvest donor organs, select the patients to receive them, perform their technical wonders in the operating room, and sometimes burn out. As demand grows and the donor supply dwindles, researchers look for new approaches, such as the use of artificial livers and genetically engineered animal livers, but these solutions are years away. Meanwhile, as McCartney adroitly demonstrates, we are stuck with a system that works for some but has enormous costs and serious ethical problems. The science is clear, the issues are well articulated, and the human beings are artfully portrayed.